Read about it on Okayplayer. 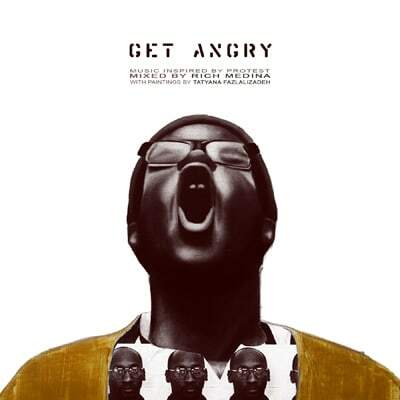 Get Angry is a collaboration between DJ Rich Medina (richmedina.com), and painter Tatyana Fazlalizadeh (tlynnfaz.com). Inspired by the fervor of protest that amounted in 2011, Tatyana created a series of paintings to illustrate the various movements - from Tahrir Sq to Wall St, from London to Troy Davis, from Slutwalk to the demand for gay marriage rights - while Rich Medina created a mix of songs that represent the spirit and energy of revolution. Included in the mix download is each painting along with a description of the movement it represents, and a powerful yet jammin' mixtape including songs by Bilal, Gil Scott-Heron, J Dilla, and more. Tatyana Fazlalizadeh, is a Philadelphia based contemporary oil painter. Her paintings capture socio-political ideas while focusing on portraiture. Her work has been published in several magazines and books and is exhibited nationally. In Get Angry, she portrays the individual protester in their moment of anger. By painting the expression of frustration, anger, and passion felt by the people, the viewer of her work is able to relate to the emotions that spark revolution. Rich Medina is an internationally known DJ. From beginning in Philadelphia, to creating legendary dance parties, to DJing shows with artists such as The Roots, De La Soul, and more, to competing on BET's "Smirnoff's Master of the Mix", Rich Medina is one of the best DJs world wide. For Get Angry, Rich created a soulful mix of hip-hop, funk, and soul songs that speak on injustice and prejudice - some of the root problems calling for protest. This is not a normal mixtape, it's a visual mixtape—combining music with visual art in a unique way that involves the listener/viewer is the theme of the project.